Boxes are not included! This empty tray is designed to hold 16 0.14 litre Really Useful Boxes (as pictured). 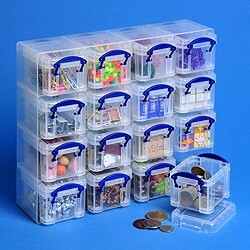 The boxes are not included unless you buy the 0.14 litre Really Useful Organiser Pack.